Revill’s in a better position than most to know how important the shop is, because he’s worked there in some form or another for the last ten years, starting out on work experience from school and then moving on to a Saturday job and now a full-time post in its distribution arm. He also makes use of the store as a customer too, as Jackmaster he’s one of Glasgow’s most promising young DJs, with a growing reputation nationally and internationally. Now, to celebrate both the 18th birthday of the shop and the imminent unleashing of their new website, Rubadub is preparing to welcome Detroit techno legend Jeff Mills to the Sub Club for a special intimate set. ‘We did his Model 500 party at Triptych a couple of years ago,’ says Revill, ‘and that was really good fun. It’s proved tricky getting Jeff back in his own right though, because he has outstanding commitments with Pressure and the Slam Tent and all that. ‘Then suddenly it’s all just come together this year. We’ve been dealing with him and his wife Yoko for many years because we distribute his label, Axis Records, in the UK, and he’s dropped in and done things at the shop before. He plays Scotland about once a year, but for him to play a venue the size of the Sub Club anywhere in the world is incredibly rare.’ And particularly exciting for Revill, an avowed Mills fan, because he’ll be the sole support to his three-hour headline set on the night. ‘I remember going in with my pocket money on Saturday afternoon,’ says Revill, ‘and not having enough money to buy everything I wanted. It’s still the same as it was then, there’s a real buzz about the shop. It’s unfortunate that vinyl does seem to be in decline year on year, but there’s still a high demand for equipment and digital DJ software is picking right up. Part of the point of the website is that we’ll also be moving into digital distribution for a lot of the labels we handle.’ Things are mostly thriving then, which is good. 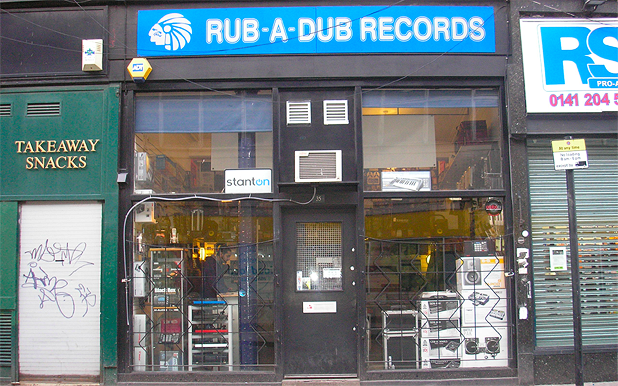 A record shop is a record shop, many might say, but one with the passion and specialist knowledge of Rubadub is to be cherished by all who use it and respected by everyone else. Rubadub Presents Jeff Mills at the Sub Club, Glasgow, Fri 23 Jul. Jeff Mills plays a rare three-hour set in the intimate confines of the Sub Club to celebrate the launch of the all new Rubadub website designed by Remote Location, and the esteemed Glasgow record store's 18th birthday. With support from Jackmaster.